Two architects, two men turning forty who have been involved professionally and personally for twenty years, are beginning to see their practice and their marriage falter. One Fall day, a peculiar young man drifts into their storefront office claiming he has car trouble, asking to use the phone. The men get to talking; the young stranger is curious but enchanting, and one of the architects ends up playing tennis with him that afternoon, ultimately inviting him home for dinner. The ensuing evening involves a lot of wine and banter and then increasingly dark conversation, and when the stranger has had too much to drink, the two men insist he sleep in their guest room. During the night, the stranger commits an act of violence which shatters the architects' ordered lives, each man in his own way over the days and months that follow coping with blossoming doubt and corrosive secrets. Will Law is a rising star in the U.S. Foreign Service, who one day mysteriously walks away from his post. Unmoored, he drifts to Paris and back into the arms of his one-time lover Pedro, another American expatriate, who is studying French architecture. Both men have grown up in the world of American diplomats and have always been sensitive to the ties of identity and belonging. But these notions aren't fully challenged until Will meets Jorie, a woman trapped in a loveless relationship with a Lebanese man. Will is quickly drawn into Jorie's fraught world when the young boy she's been caring for is kidnapped by a French Nationalist gang. Fighting against a rising tide of anti-immigrant hatred, the three Americans launch a desperate search across the city. In the process, Will must challenge the moral burdens of his past, and in an attempt to rescue the child, he must also find a way to redeem himself. Absorbing, suspenseful, and rich with evocative details of an unfamiliar Paris, Light at Dusk explores diplomacy in its most public and intimate consequences. Upon the breakup of his marriage, Jason Dark returns to his late father's home, a stone house in Northern California, with a seventy-five-year-old vineyard grown over from neglect. While nursing the vines back to life, Jason begins to heal himself, opening a law practice in the small town nearby and eventually reuniting with his wife, Julia, and their son, Tim, who come to live in the now-thriving winery. Yet Jason cannot rid himself of one habit that bespeaks a restless urge: his evening drives through the mountains. One rainy night, driving recklessly on what should have been an abandoned road, he hits and kills a teenaged boy. The decision he makes-to protect his family, his budding wine business, and his law practice-changes the course of Jason Dark's life forever. Jason chooses not to reveal his involvement in the accident, believing it will remain an unsolved incident. Then another man, a drifter named Troy Frantz, is arrested and charged with the crime. Jason finds himself defending an innocent man on trial for his life-and only Jason knows the truth that can save him. 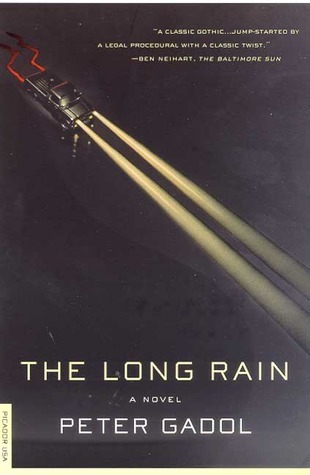 The Long Rain is a masterful tale, carefully layered, told with grace and speed and power, a novel that places an ordinary man in the most profound moral crisis and leaves the reader wondering "In that circumstance, what would I have done?" Following the death of his lover, Brad Gray drifts from New York, wandering westward in a loose succession of house-sitting jobs. Lonely and desperate for companionship, he arrives in California at an empty home overlooking Encantado Canyon, a wildfire-charred valley near Los Angeles. One day, peering through a telescope, Brad spies the skeleton of another home being built by a young couple across the canyon. Eventually Brad meets Ethan and Helen Zayne, and after some reluctance is drawn into their quixotic project. Working from a how-to book and sketchy blueprints, the Zaynes envision a glowing, light-filled home with a commanding view-but their true motives are darker and more interior. The three become fast friends; soom the Zaynes move into Brad's house-sit, by day carpentering and stone-masoning, by night swimming, drinking, and imagining their finished home. The Zaynes are golden and beautiful, semingly the perfect couple. Brad feels revitalized by their exuberance, until problems with the construction reveal deeper flaws in a marriage with many secrets. As Santa Ana winds spark the canyon, Brad and restless, troubled Helen begin a series of break-ins into other homes, escalating risks as they search for clues to the elusive utopia they both want to create. In Closer to the Sun, Peter Gadol has lyrically evoked the fragile California landscape and the enterprise of building to tell a deeper story: a suspenseful and profound inquiry into the dreams, desires, and private architectures that form the foundation to a home. Eric Auden, recently estranged from his wife and the world, finds himself one snowy day in New York's greatest art museum confronting the cool marble contours of the Goddess of Desire, forty-five centuries old and still a bit of a flirt. Helplessly enchanted, and hoping to revise his life, he steals her. The Mystery Roast, Peter Gadol's magical novel, shows what happens when Desire is set loose in the world. With the stolen statue, Eric moves into a loft building in the gray and gritty frontier of Manhattan's far West Village, upstairs from the Mystery Roast Cafe, an outpost of funk and fine food where not even Andre the proprietor knows what beans go into the blend of each day's coffee (it's anyone's guess and everyone guesses). There Eric is reunited with his childhood friend Timothy, an artist who is Andre's on-off lover, and falls headlong for an enigmatic gadget designer named Inca. Together they concoct a scheme to sell reproductions of the ancient idol, the Goddess of Desire. But the mystery thickens when Eric's mother, Lydia, falls in love with the museum official investigating the theft. And watching fascinated from his Central Park penthouse is Lydia's ex-husband, Jason, the reclusive philosopher-guru, who just might have to come down from his perch to rescue the entire cast of lovers and inventors, detectives and thieves. The Goddess of Desire-with Eric Auden in tow-skewers her way through New York from the quirky cafe in the meat-packing district to posh East Side parlors, from a trendy downtown gallery to countless lonely bedsides, inspiring yearning everywhere she goes. The Mystery Roast is a carnival of urban romance, a tale of interlacing intrigues, and a story of love and longing delivered in a sure, fresh, surprising, and imaginative voice. The hero of Coyote is a young man named Coyote Gato, a loner who has spent his life wandering the desert of the American Southwest. Coyote believes he was mystically conceived beneath the desert's Great Tree; he also believes he can turn himself into a cat. Now, at age twenty-one, he makes his living by removing all the street signs near the dying desert town of Frescura so he can guide potential pilgrims to a mysterious local ashram. One hot summer day, Coyote hitches a ride with Madeleine Nash, a veteran journalist on a mission to investigate the ever more powerful and secretive cult that runs the ashram. Madeleine, too, is a loner. Her own tragic secret has led her back to the harshly beautiful desert she once knew well. In an atmosphere of free love, cosmic longings, a little magic, and occasional folly, Coyote and Madeleine explore an ashram that has become an oasis for disoriented people dressed in mauve jumpsuits and looking for salvation. It's presided over by one Guru B-no one knows what the B stands for-who wears eight wristwatches at a time, owns more than seventy sports cars, and smiles spiritually and frequently, but who never speaks. The ashram's secrets include the whereabouts of the giant, glistening meteorite that was stolen from Coyote's mentor, the renegade physicist and astronomer Frog Reading. Coyote is determined to help recover the meteorite for Frog. In the process, he assists an archaeologist named Amy as she surreptitiously excavates a long-lost Indian city-and he starts to fall in love with her sculptor-brother, Matthew. But Coyote also uncovers the ashram's nefarious designs on the desert. At last, Coyote and Matthew, Frog and Madeleine must unite to try to rescue their landscape, their meteorite, and their haphazardly improvised family. The fiery climax involves banana mint ice cream, love lost and found, the Great Tree, and the lost city itself. 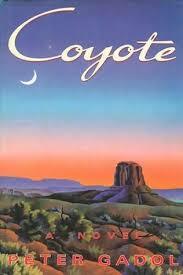 Filled with very human magic, Coyote marks the debut of a writer of rich and confident imagination. 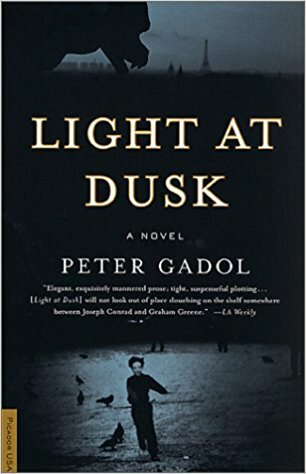 Peter Gadol shows how, even amid the unkindest of climates, people might put aside loneliness long enough to love.